Gov. Jennifer Granholm’s current economic agenda rests upon the energy sector. In myriad speeches and appearances in recent months, the governor has touted renewable energy, such as solar power, wind power and landfill methane, as a wellspring of new jobs and investment for the state. There is certainly nothing wrong with individuals, entrepreneurs or interest groups pursuing the idea of renewable energies and finding ways to make them economically viable. Hydropower, wind and biomass generation have been established in Michigan for many years and are economically viable sources of electricity in some instances. An RPS is fashionable policy to be sure, one adopted by some 25 states and the District of Columbia. But renewables are not necessarily environmentally benign. Meanwhile, the rising popularity of RPS policies among legislators has been accompanied by a dramatic rise in the cost of renewable energy components. Not surprisingly, renewable energy currently costs more than conventional energy. According to the Michigan Electric and Gas Association, "Fossil units and nuclear power have a huge inherent cost and deliverability advantage over renewables due to the concentrated energy in the fuel compared to the diffuse and variable energy of wind, solar or hydro." Typical RPS proposals would, if enacted, constitute a dramatic expansion of the powers of the Michigan Public Service Commission. There are instances in which this expanded authority would usurp legislative functions — granting, for instance, the MPSC the power to determine what quota of total energy production should be supplied by renewable sources. This is a policy decision, not an interpretation of a statute, and as the Michigan Supreme Court has written, "Policy determinations are fundamentally a legislative function" — not the prerogative of an agency of unelected officials. Were renewable energy affordable and efficient, a government mandate would not be needed to make people buy it. Under an RPS, the principal winners would be the alternative energy suppliers who have otherwise been unable to attract capital investment or consumer interest based on the merits of their product. To subsidize only select forms of energy would disadvantage other rich sources of power in the state. [**] For example, Michigan has more natural gas reserves than any other state in the Great Lakes region. The Antrim natural gas fields, in the northern Lower Peninsula, are among the largest in the nation. Despite the governor’s promises of job creation and investment, there has been a notable lack of explanation for her numbers. Lawmakers need to consider whether such a major public investment can be justified given the financial stress experienced by a great many Michigan families, who would pay higher electricity bills to subsidize renewable energy producers. 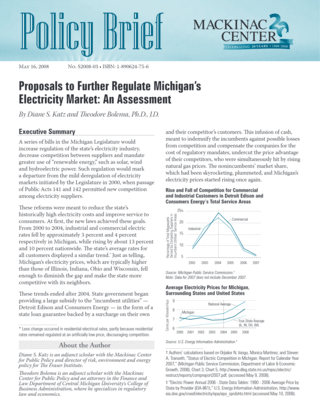 As noted by the Michigan Electric and Gas Association, "(I)f the public is going to be asked to make a major financial commitment to a particular generating technology, there should be some consideration of alternative uses for that money." Proponents also contend that a renewable quota would benefit the environment as well as the economy. According to Lark, "Every MWh that is generated by a renewable resource or that is avoided through use of efficiency measures displaces a MWh of fossil-fuel-fired generation and its associated emissions." But that reasoning is flawed. Most renewables at present can only produce intermittent power and, therefore, cannot be relied upon during periods of peak demand. Under the current regulatory framework, utilities must maintain a conventional unit in standby mode, which means that emissions and fuel use are not displaced. As it is, considerable progress has been made in reducing power plant emissions. According to the U.S. Environmental Protection Agency, the electricity industry will spend nearly $48 billion between 2007 and 2025 for new controls on emissions of nitrogen oxides, sulfur dioxide and mercury. Meanwhile, the use of coal as a feedstock is decreasing. 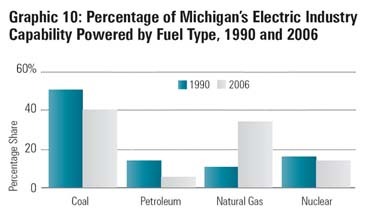 Between 1990 and 2006, the percentage of Michigan’s electric capability fired by coal declined by 22 percent. Likewise, the percentage of the state’s capability powered by petroleum decreased by 64 percent, even as the percentage fueled by natural gas increased by 249 percent. In the absence of renewable-energy quotas, advances in demand-size efficiency are ongoing. New and improved technologies are expected to increase the energy efficiency of the economy overall at an average annual rate of 1.8 percent through 2030. There is also reason to believe that an RPS will fail to revive the state’s economy — just as a multitude of other government jobs programs have failed. According to recent analyses by Michael D. LaFaive, director of fiscal policy for the Mackinac Center, the Michigan Economic Development Corp. received appropriations of more than $1.6 billion from federal, state and other sources since 1999. But between 1999 and 2006, Michigan still lost 244,000 jobs, and the unemployment rate is the highest in the nation at 7.2 percent. Moreover, an extensive econometric evaluation of the Michigan Economic Growth Authority, the MEDC’s primary economic development program, indicated the authority’s tax breaks to favored firms had no statistically significant impact on employment or per-capita income at the state or county level. State officials’ failure to promote economic growth through favors to specific companies does not bode well for the governor’s attempt to improve the economy by subsidizing producers of renewable energy. [*] House Bill 5548 and House Bill 5549 have passed the Michigan House. According to www.MichiganVotes.org, they "mandate that Michigan electric utilities acquire 4 percent of their power from ‘renewable’ sources by the end of 2012, and 10 percent by the end of 2015. The mandate would be reduced to the extent it increased residential rates by more than $3 per month, and on commercial customers from $15.83 to $187.50 per month. Utilities could meet the mandate by producing or purchasing renewable energy, or purchasing ‘credits’ from a firm that exceeded the mandate. The provisions creating this regime are divided between [the two bills]." Senate Bill 1000, which has passed the Michigan Senate, would create similar requirements. According to MichiganVotes.org, the bill would "mandate that utilities from which the state acquires power to obtain 10 percent of their energy from ‘renewable’ sources (not including nuclear) by 2010, and 25 percent by 2025. However, the requirement would be waived if the cost of the renewable energy is more than 5 percent greater than conventional or nuclear power." [†] Doug Roberts Jr., "Memorandum to Members of the House Committee on Energy and Technology," (Michigan Chamber of Commerce 2007), http://www.michamber.com/docs/ homepage/hb4562.pdf, (accessed May 11, 2008). The Chamber’s estimate focused on wind power, excluding the proposed use of wood chips and switchgrass to generate electricity, but the omission is understandable. At present, the process of converting these plant fuels into electricity is only experimental; there are no cellulosic plants in normal operation. [**] House Bill 5972, House Bill 5977 and House Bill 5898, for example, would provide subsidies to certain businesses involved with solar power. According to www.MichiganVotes.org, House Bill 5972 would "grant a business tax break based on the price it pays for electricity to the Hemlock Semiconductor company and perhaps other producers of polycrystalline silicon used in solar cells and semiconductor chips." House Bill 5977 would allow the state’s Michigan Economic Growth Authority to provide tax credits to the same company (or companies). Both bills have passed the state House, and both are currently tie-barred to House Bill 5524, which would establish a cap on the amount of competition that nonincumbent suppliers can provide (see first footnote in “Remonopolization”: Ending Partial Deregulation). House Bill 5898 would, according to MichiganVotes.org, "authorize a refundable Michigan Business Tax credit equal to 50 percent of the amount invested or expended on research, development, and manufacturing of photovoltaic energy by a firm for whom this is its primary activity. ‘Refundable’ means that if the credit exceeds the firm’s tax liability the state would send it a check."